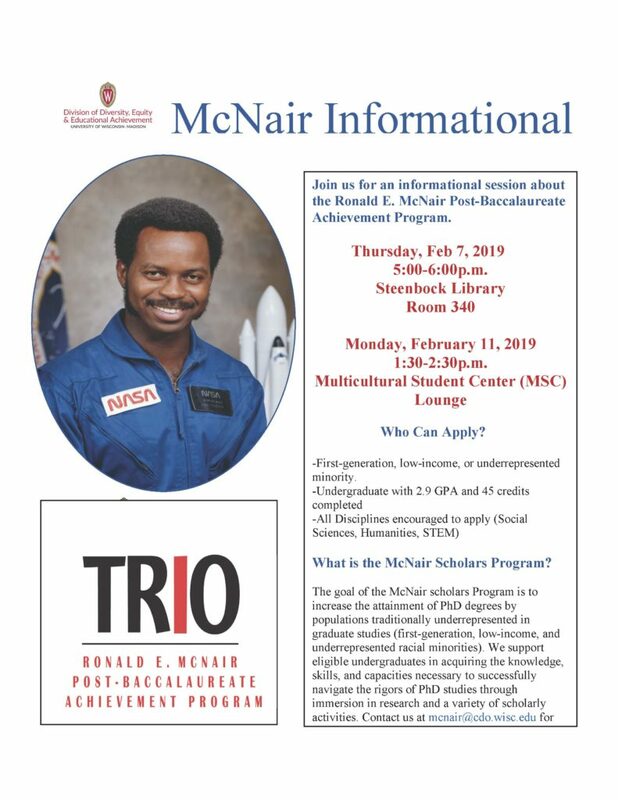 We are pleased to announce the UW-Madison Ronald E. McNair Postbaccalaureate Achievement Program (now part of the Division of Diversity, Equity, and Educational Achievement) recruitment for new applicants for the 2019-2020 academic year! Our program supports eligible undergraduates in acquiring the knowledge, skills, and increased capacity necessary to successfully navigate the rigors of doctoral studies through yearlong immersion in research and scholarly activities, including summer research. The goal of the McNair Scholars Program is to increase the attainment of doctoral degrees by students from underrepresented segments of society. We encourage low-income, first-generation college students as well as students from groups historically underrepresented in higher education to apply. For additional information on eligibility guidelines and program requirements, please view our website at mcnair.wisc.edu. We are hosting two informational sessions (see attached flyer and info below) for students interested in applying to the program. Applications are due Feb. 15, 2019, via Wisconsin Scholarship Hub (WiSH). We are hosting two informational sessions (see attached flyer and info below) for students interested in applying to the program. Applications are due Feb. 15, 2019 via Wisconsin Scholarship Hub (WiSH). If you have any further questions, please email us at mcnair@cdo.wisc.edu.